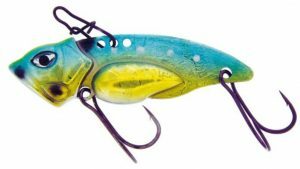 We’ve talked about blade baits in the past but I think we should take another look at them, especially now that we’re heading into fall. A lot of guys fish blade baits only one way. They throw them out, let them sink to the bottom, rip ‘em up as hard as they can and then let them fall back down on a slack line. You can catch a few that way. There’s no doubt about that, but there are other ways that’ll catch more than a few. I go with three basic techniques when I’m fishing a blade bait. The first is similar to what I’ve described above except that I don’t rip my bait. I pull it. My pull creates a slower and smoother vibration as well as more of an angled rise. Based on my experience the combination of those three things generates more bites. Another technique I often use is that I fish a blade bait like I would a lipless crankbait. All I do is cast it out, let it sink to the desired depth and wind it back. A blade bait creates a much smaller profile that’ll mimic local forage better in some waters and it’ll give you a harder thump at times. You get the harder thump by attaching your line to the back hole in the top of the lure. Here’s how that works. The front hole will give you the tightest vibration, the middle hole the next tightest and the back hole the widest and heaviest vibration. It’s simple, really. The farther back the hole the wider the vibration. I like a tight vibration for clear water but switch to the back hole when the water gets muddy. The middle hole is a good all-around choice. My lure choice is a Molix Trago Vib. It comes in three sizes and weights as well as a dozen different colors. If you can’t match the hatch with one of them, you’re fishing someplace I’ve never been. The last way I fish a blade bait is with a yo-yo style. This is like the first technique I described except that it’s a little more vertical and it has as steady, measured cadence to it. I make short casts and then pull it up before I let it fall on a semi-slack line. 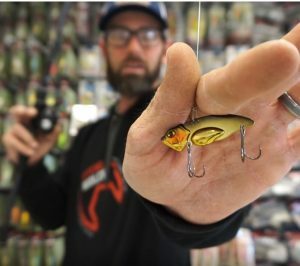 With the exception of when I’m fishing my Trago Vib like a lipless crankbait the idea is to get vibration as you pull it up and then allow it to look like a dying baitfish on the fall. Somebody once said that the only reason you lift a blade bait is so that it’ll fall back down. That’s not a perfect description of how I fish one, but it’s pretty darn close. One last thing: A lot of guys complain that blade baits snag on everything in the water. That’s true if you use a standard three prong treble hook on them. If you’re fishing something other than a Trago Vib, you can clip the forward prong off both the front and rear hooks with a pair of side cutters. But, if you fish with Molix Trago Vib they have a specialty two prong hook on them already so everything is good to go right out of the package. Either way, not having a forward facing point on the hooks won’t hurt a thing. You’ll catch just as many fish. Blade baits are more versatile than many anglers think. Fish one this fall and you’ll know I speak the truth. Check out my previous blog about blade baits: “Blade Baits aren’t just for Deep Water.